Every year, countless horses go without enough food, shelter or love. Sunrise Horse Rescue is a nonprofit horse rescue and sanctuary located in Napa County, California. We are dedicated to saving horses and providing them with forever homes. Children and adults in the community gain life-enhancing skills by assisting in the rehabilitation of these horses and providing them with the loving attention they so deserve. We welcome volunteers age 6 and older to work with the horses. No experience is necessary. We have a training program to help you learn about our barn and the horses. It costs between $6,000 and $8,000 a year to support each of our horses. We provide food, veterinary care, shelter, training, and lots of love! Your donation will truly make a difference in the life of a horse. Sunrise Horse Rescue was founded in November of 2007 as a 501(c)(3) nonprofit organization. We are located in the heart of the Napa Valley, in beautiful Calistoga, California. 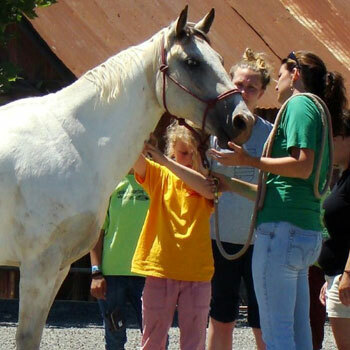 To rescue and provide sanctuary for abused and neglected horses in Napa and surrounding counties, as well as provide community members of all ages with life-enhancing skills and experiences derived from horsemanship. Subscribe to our Quarterly Newsletter to stay up to date on all the great work we're doing at Sunrise Horse Rescue! Thank you, you will now be kept up to date on the happenings at Sunrise Horse Rescue!